Media captionA charity which gives counterfeit clothing to people in need is expanding its operation. 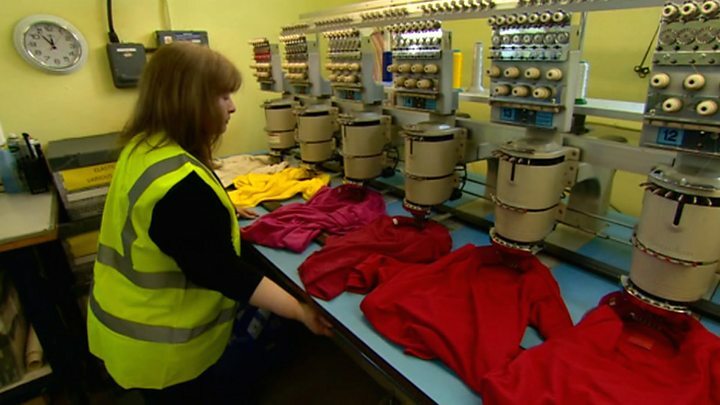 A charity which gives food and counterfeit clothing to people in need is expanding its operation. His Church in Lincolnshire runs a "rebranding" factory which sees fake items stripped of their logos and sent to homeless hostels and other organisations in the UK and abroad. The charity works with the support of major brands such as Ralph Lauren and Tommy Hilfinger. It also redistributes surplus food donated by shops and manufacturers. The church has opened a new cold store to help it increase on the 3.5m meals it distributed in 2108. Carl Simpson, from Hull-based Raise the Roof homeless project, described the food supply as "fantastic". "It helps us to supply hostels, food banks and soup kitchens across Hull." The His Church operation is based in a 50,000 sq ft former aircraft hangar. Co-ordinator Richard Humphrey said it worked with more than 3,000 charities, including homeless hostels, women's refuges and refugee camps. The clothing operation began 10 years ago when the charity discovered that trading standard teams across the UK were destroying "tonnes and tonnes" of seized counterfeit items. Since then, it has redistributed more than £50m worth of clothing over the past decade. "We take all the branding from the clothing off and we brand it with our own logo which means it is now legal, and it can go and help people who genuinely need it," he said. "These are brand new, so it is not just the fact that they are warm and they are safe, but they're also restoring dignity to people who are going through a difficult time." The rebranding is done using an industrial sewing machine seized in a raid on a counterfeiters factory.